Intimate test kitchen from longtime Pasadena chef Claud Beltran. : Claud Beltran, longtime Pasadena caterer, restaurateur and chef (Noir Food & Wine), has opened a restaurant at a location where a series of mostly ethnic establishments have failed. The difference is that Beltran has a large following in the Crown City and this upper-middle-class East Pasadena neighborhood has a dearth of quality dining options. He’s treating this little venture as kind of a test kitchen, but it's quickly becoming part of the local dining scene. 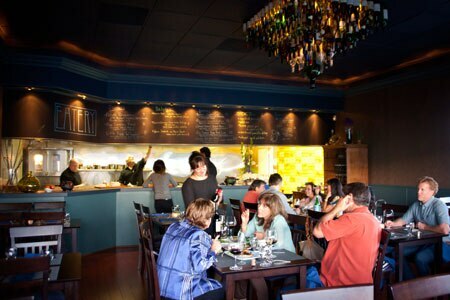 Even before approval of his liquor license, the 40-seat eatery is regularly full, with guests enjoying items like potato croquetas, pork Wellington, a refreshing beet salad with burrata, petite rib-eye steak, and chocolate bread pudding with salted caramel sauce and candied bacon. One month, the chef may decide to showcase seafood almost exclusively, presenting dishes like seared scallops with toasted pistachio vinaigrette, or skate wing in a classic butter-caper sauce. The space, previously austere, is suddenly sophisticated, with taupe walls, polished wood and an impressive chandelier constructed from wine bottles.